We so so love our Nokomis neighborhood and everyone that has supported us over the changing years. We would love it if you all celebrated with us. Al Vento will be 15 years old!!! The event will be open house style from 6-9 PM. We will have a buffet (check back for details on food) that we are accepting donations for. 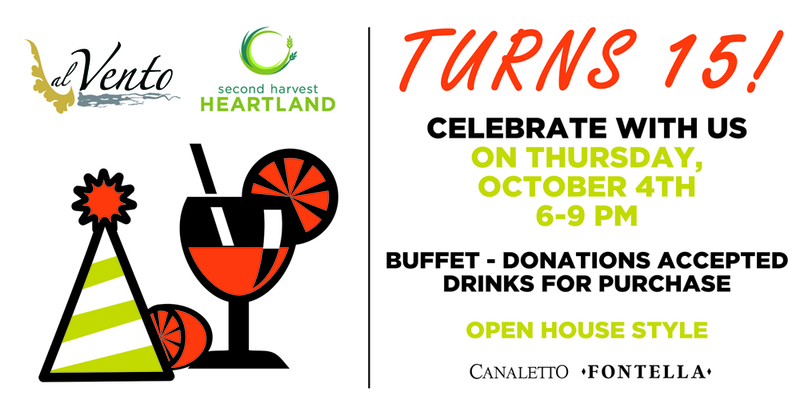 All donations will benefit Second Harvest Heartland. There will also be drinks for purchase. We are not accepting reservations for the event. Everyone is welcome to walk-in, chat, eat, drink, and dance with us!